Home > Lighting > Candle Holders > SALE! Tall Glass Candle Holders - Set of 2 - Cylinders & Long Stem - 8"
Crisp, Clean, Elegant! 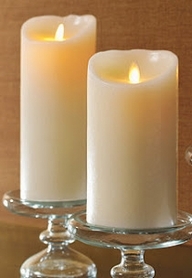 Classy looking centerpieces start with sophisticated decor pieces like this Set of 2 Long Stem Glass Candle Holders. The cylinder shaped cups sitting atop crystal clear stems make any table look upscale and this style is always refreshing, always fashionable! 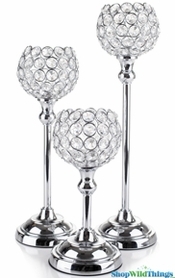 You will receive 2, 8" tall by 3" wide by 3" deep crystal clear holders to add instant panache to any table setting. 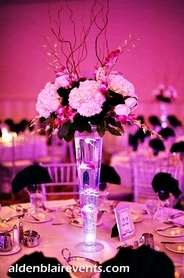 These are a chic centerpiece by themselves and the height is low enough to see over. 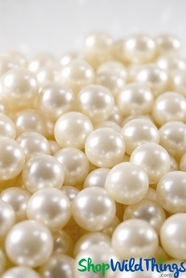 You could also set them on a mirror to enhance these beauties! Create a colorful rainbow display by submersing Waterproof LED Lights in water pearl jelly decor or float LED Candles or Single Foam Roses in water. Fill with LED Ice Cube Litecubes, battery operated Fairy String Lights, rose petals or Sparkling Diamond Confetti or Pearls. There are many fun options to suit the theme of your party and your personality!